We had the best show today. 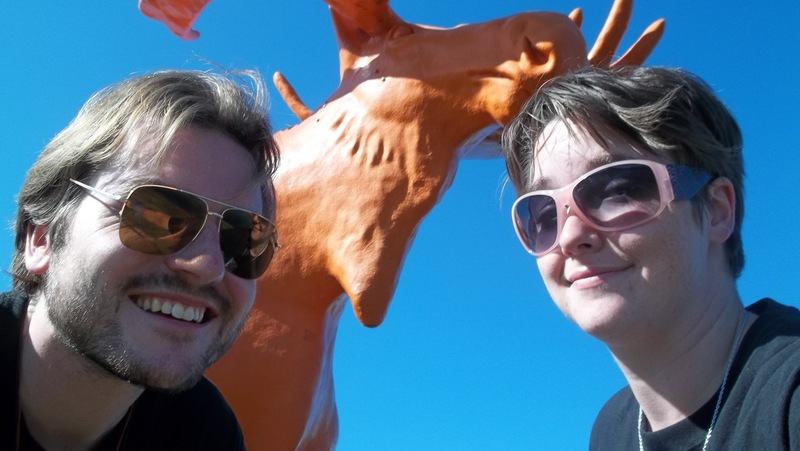 With Andy and the Orange Moose of Wisconsin. Not taken today, but I thought it was too good a photo to pass up. It all started with a drive up the mountains on windy roads. When we got to the town, I went in to meet Principal Richard. Richard is a kind older gentleman, the kind of man you want your children to know. He treats every single one of the kids as his own. He plays with them, jokes with them, gives them hugs. We set up for the show and we were finished about 20 minutes before go-time. Richard came in and asked if we wanted to start early. We always say yes to that question. So he started bringing the classes into the gym. The entire pre-K through 6th grade school came to see the show. They were the best audience we’ve had so far. So attentive and excited. When we got to the ‘volunteer’ section of the show, I say the following. Before I even said the word help, a young boy in the back with an orange sweatshirt on raised his hand like a shot. I typically pick the first hand that goes up, or the child that looks the most excited about answering questions. This boy beat me to the punch, so I immediately went to him. As Andy and I play our scene, occasionally I turn to the volunteer to ask him or her a question pertaining to the information we learn throughout the show. Things like ‘should we turn off the light when we leave the room?” and “Should we ask our parents to replace old lightbulbs with compact fluorescent lightbulbs?” They are all “yes” answers, but the kids feel like they are contributing and are very excited to be a part of a show. Channing was no exception to the rule. In fact, he was the rule. He expounded on the importance of saving energy, interrupting me several times to tell me why we should save energy and how to do it. Teachers were laughing so hard. One of them wiped tears from her face. Another teacher took out a camera and started snapping pictures. The other students were cheering Channing on. It was a lot of great energy. At the end of the volunteer section, Channing took his seat and he beamed with pride as the students around him gave him high fives and pats on the back. We wrapped up the show and told them they were our best audience. The principal asked us if we could take a photo with the kids, so we posed with them for one smiling shot, then a silly shot. Then they returned to class. As we were tearing down the set, Richard came back and asked if we wanted some refreshments. He brought us bottles of water and homemade cupcakes. I think it may have been the best cupcake I have ever had. Then he asked us why we chose Channing. I told him simply that typically the first kid to shoot their hand up was paying the most attention and deserves the shot. Then we learned that Channing was autistic. Richard told us how he really came out of his shell with us and how cool it was to see him do that. We were thrilled to learn that we made such a difference in this young boys life. Beyond that, it was a thrill to share the stage with him! His knowledge of energy conservation put us to shame! He was the best kid ever.